"The key to making Erica's mom's recipe for rice pudding healthier is using brown rice instead of white. It's delicious and nutritious!" Combine water and rice over high heat in a saucepan and bring to a boil. Reduce heat to medium-low, cover, and simmer until tender, about 45 minutes. Combine cooked rice, 1 1/2 cups milk, sugar, and salt in a clean saucepan. Cook over medium heat until thick and creamy, 15 to 20 minutes. Stir in remaining 1/2 cup milk, beaten egg, and raisins. Cook 2 minutes more, stirring constantly. Remove from heat and stir in butter and vanilla extract. Serve warm. This recipe may also be made using sugar-like sweetener (such as Splenda ®) instead of sugar. Use 1/3 the amount. This is an easy way to enjoy this great creamy recipe but cut down on the sugar and calories. 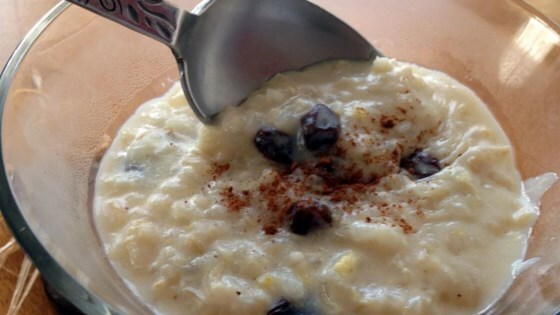 This recipe is a healthier version of Creamy Rice Pudding. I love it! I used honey instead of sugar and dried cherries. Yummy! ! Yum! Made this with coconut/almond milk. Doubled the recipe but used only 1/2 cup sugar (it's def sweet enough) and omitted the raisins. Also added some cinnamon. Soooo good!! !